Supramolecular chemistry is 'chemistry beyond the molecule'. While traditional chemistry focuses on the bonds that hold atoms together in a molecule, supramolecular chemistry examines the weaker interactions that hold groups of molecules together. Important concepts that have been demonstrated by supramolecular chemistry include molecular self-assembly, folding, molecular recognition, host-guest chemistry, mechanically-interlocked molecular architectures, and dynamic covalent chemistry. The importance of supramolecular chemistry was established by the 1987 Nobel Prize for Chemistry, which was awarded to Donald J. Cram, Jean-Marie Lehn, and Charles J. Pedersen in recognition of their work in the field. The past decade has seen dramatic developments in the field, with supramolecular chemistry leaving its roots in classical host guest chemistry and expanding into exciting areas of materials chemistry and nanoscience with many real and potential applications. Supramolecular findings are evolving our understanding of the way chemical concepts at the molecular level build up into materials and systems with fascinating, emergent properties on the nanoscale. Supramolecular chemistry: the biggest challenge yet! "Creating that link between the chemist's understanding of the way in which molecules interact with one another, and the understanding a materials scientist, engineer or biologist has of the resulting properties of a material or system comprised of those molecules is one of the huge grand challenges facing modern molecular science." Supramolecular Chemistry: From Molecules to Nanomaterials is the first major reference to link supramolecular chemistry and nanotechnology. A global team of experts present an overview of the concepts and techniques of modern supramolecular chemistry, demonstrating how these paradigms evolve into nanoscale systems chemistry, nanotechnology, materials science and beyond. Breaking down the barriers between synthetic chemistry and materials science, the authors demonstrate how modern techniques allow access increasingly far along the 'synthesising-up' pathway. 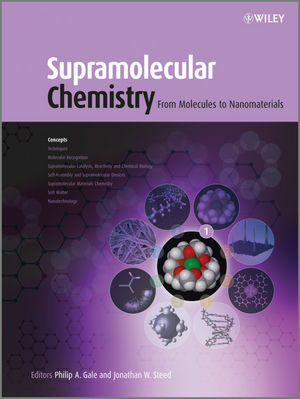 Supramolecular Chemistry: From Molecules to Nanomaterials explains the fundamental concepts and provides invaluable practical guidance on the applications and limitations of modern instrumental techniques for addressing molecular and materials-based problems. Professor Gale is currently Head of the School of Chemistry at Southampton University. He is the author or co-author of over 160 publications including two books and a series of highly cited review articles on anion complexation. Professor Gale has won a number of research prizes and is the co-editor of the journal Supramolecular Chemistry, a commissioning editor for Chemical Society Reviews and a member of the international editorial advisory boards of Coordination Chemistry Reviews, the Encyclopaedia of Supramolecular Chemistry, The Open Inorganic Chemistry Journal and Chemical Communications. Professor Gale is also a member of RSC Science Policy Board. Jonathan Steed is Professor of Inorganic Chemistry at Durham University. He is co-author of the textbooks Supramolecular Chemistry (2000 & 2009), Core Concepts in Supramolecular Chemistry and Nanochemistry (2007) and around 250 research papers. He has edited the Encyclopaedia of Supramolecular Chemistry (2004) and Organic Nanostructures (2008).